Season 2 Episode 5 of the LiveCampWork Podcast! 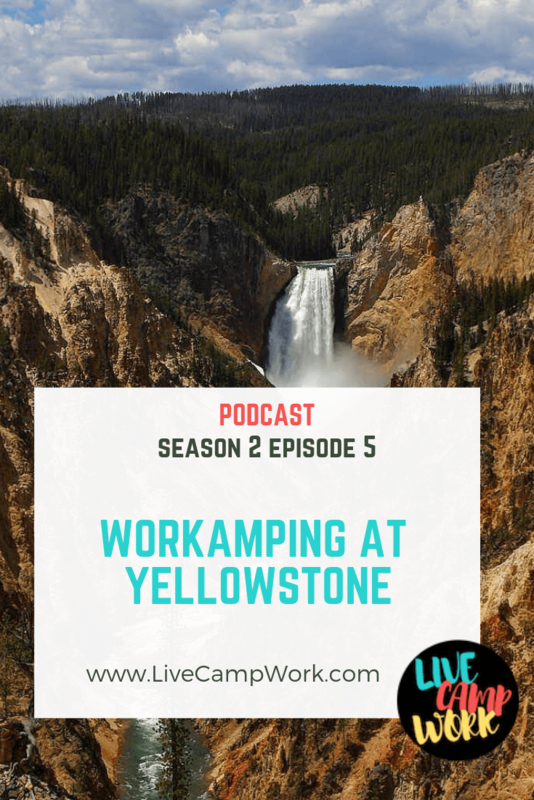 In this Episode, I’m talking about RV jobs at Yellowstone National Park! Workamping for Delaware North, who operates 12 general stores inside the worlds 1st National Park. You might consider this as an option for the summer if you are interested in outdoor adventures and want to work a little as well. Come along for the adventure as I navigate through the world of Workamping with real information, tips & trick, stories from the road, and interviews from Workampers and Employers! You can download the episode or just click and listen online! Full transcript is available below. Thanks for tuning in today for Season 2 Episode 5 of the LiveCampWork Podcast. Today I’m talking about Workamping at Yelowstone National Park for Delaware North! Delaware North Parks & Resorts at Yellowstone National Park operates 12 General Stores inside the world’s first national park where guests enjoy an array of gifts and keepsakes to take home from their trips. Delaware North also serves meals at the Fountain Grills and offers groceries, equipment and supplies. Imagine what a few months spent exploring natural wonders like Old Faithful Geyser, would be like! This could be the Workamping adventure you’ve always dreamed of, and its more attainable than you might think! As a Workamper in Yellowstone, you will have the ultimate ‘local’ experience of living inside the park and the spectacular ability to go beyond what millions of tourists are able to see in short visits throughout the summer. As an employer, Delaware North does a great job of offering positions to a variety of people from all over the globe. From retirees to younger travelers, college students, international guests and everyone in-between, they hire a diverse group of people to help bring great experiences to visitors from all around the world! When you make the decision to work at Yellowstone, you really make the decision to have a great summer! If you love the outdoors and/or have an urge to explore, this is the place for you! I like to think that, this is the cream of the crop when it comes to Workamping experiences because it offers so many activities for Workampers to enjoy throughout their time working there. As you can imagine there are many reasons why you would want to apply for a position to work at Yellowstone but just incase you need a push- let’s look at some of them. FREE 7 Day Workamping Course to see if it’s right for you! With 1,000 miles of hiking trails, everyone can find their perfect hike from day trips to backcountry excursions. As home to more than 10,000 geysers and hot springs to explore at your leisure, fun is waiting for you everywhere. Employee Recreation Program Co-op: Offers trips around the park for employees like rafting, sporting events, talent shows, backpacking and more, all for FREE. The Yellowstone Workamping season usually starts early to mid-April and wraps up towards the end of November. It’s kind of similar to other Workamping programs, where you have the ability to provide a start date and then they will do their best to place you at one of their locations and I’m pretty sure they are looking for commitments with a 4-6 week min. You can expect to work 32-40 hours per week, per person. They hire singles, couples, and families, but make sure to discuss your scheduling needs up front. Sometimes split shifts are required which might not work for families needing opposite shifts to account for child care. And some times they fill all their single Workamper sites in the beginning of the hiring season, leaving solos in a situation where they’ll need to team up with someone choose dorm housing! The team at Delaware North is very welcoming and do a great job of trying to accommodate everyone’s needs. They also have a very straightforward approach to RV requirements… it just has to have all hard sides to be considered acceptable. Tents and tiny houses are not allowed, but sckoolies are a-okay! I’ll cut straight to the chase on this topic… working at Yellowstone will not make you rich! The wages are on the lower side of the average pay scale and start at about $9.50 (sometimes more) an hour, which is paid weekly. You’ll be living at Yellowstone all summer long, and so for that reason I approach working at Yellowstone as a job you take on for an adventure, to explore the location, and to create memories-not one that pays for further travel adventures down the road. Also, as a huge bonus, like literally, you will receive a $3 per hour bonus for all hours worked on your final paycheck when you complete the time agreement you signed up for! That’s a great bonus, when most employers offer $.50-$1.00 per hour bonuses! So keep that in mind while you make the decision on if this Workamping job is right for you. Dormitories and RV sites are both available onsite living options for employees. RV campgrounds are shared with Xanterra employees but are not open to the public. While FHU RV sites are not provided FREE with your employment, they are highly discounted and start at about $32 per week plus electric, which is payroll deductible. Most of the RV sites for Workampers are close to the stores, maybe a mile away, and if you are working at the Hotels, they are within walking distance. Slides and size of the RV are some of the constraints of the available campgrounds. Sites that accommodate long rigs and those with ample space for slides will be limited, so try to plan and apply early. To my understanding, Yellowstone is considered to be very remote. Big box retailers, hospitals and general shopping are not close by and would require a trip to town to pick up necessary supplies and medications, or to be seen by a physician. The seasonal employee health program known as Medcor, is not optional. Its required for all employees by the National Park Service and the cost is just under $8 per week. Medcor isn’t actual insurance or healthcare for that matter and should not be relied upon as such. It is more of a way to cover some of the costs of basic medical services offered at the three in park clinics, which are then offered at a discount to employees. Most, if not all positions, are physically demanding and can be quite strenuous at altitudes between 6,000-8,000 feet. But in general here are some of the basic positions they hire for each season. It has been said that technology while living in Yellowstone is comparable to what was available more than a decade ago… this would obviously drive some folks crazy, while others will appreciate the chance to disconnect. In some parts of the park the internet and cell phone connectivity are limited, and in others it’s totally unavailable. Be prepared for this experience and think carefully on how being limited in your connectivity will affect you. Wi-Fi is available, though very limited, and some dorms have computers with internet available. Verizon is the best cell provider in the park and pay phones are available at all locations. For some people this alone would be a deal breaker, I might be included in that group as I spend way too much time checking my phone for messages, emails and liking things on social media. We could probably spend a few hours talking about that- but let’s not. As a matter of fact let’s wrap it up for today! If your interested on working for Delaware north, I will list their contact information in the show notes so you can follow-up directly. They do like for you to fill out an online application, but if you have questions you can reach out to them directly. Alright, that’s gonna be all for today on the Live Camp Work Podcast! Thanks so much for tuning in today and please hope on over to iTunes and leave me a review to help more people find this information! Feel free to share the links with your friends and family as well as anyone you think might find value in it! I wish you safe travels and many adventures.